The Northwest Regional Professional Development Center honored 12 area teachers during its annual banquet Sept. 6. 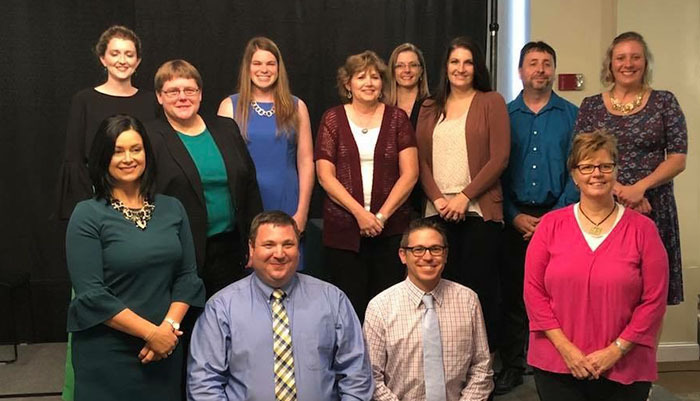 Pictured in the front row, left to right, are Cassie Pope Bejan, Ryan VanDyke, Aaron Konrad and Stacey Calfee; pictured in the second row are Spenser Naylor, Terri Clement, Kirsten Applegate, Debbie Tomlinson, Mandy Klenk, Katie Jenkins, Tim Roush and Ashley Kountz. The Northwest Regional Professional Development Center at Northwest Missouri State University on Sept. 6 honored the work of 12 area teachers and named its 2019 Northwest Missouri Regional Teacher of the Year. Kirsten Applegate, a middle school mathematics and computer science teacher in the Stanberry R-II School District, received the Teacher of the Year award and a $250 cash award at the annual Northwest Regional Teacher of the Year Celebration on the Northwest campus. 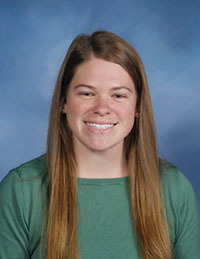 Applegate received her bachelor’s degree in education with a middle school emphasis at Northwest in 2014 and has worked in the Stanberry School District for three years. She will next represent the Northwest region and be recognized at the Missouri State Teacher of the Year Awards Banquet on Oct. 22 in Jefferson City. The Missouri Regional Teacher of the Year program is designed to focus public attention on excellence in teaching and to honor classroom teachers in all regions of Missouri. Recognition of outstanding teachers establishes a culture that rewards excellence in teaching validating the work of teachers. It also provides teachers a platform to speak and share about educational issues as well as showcase teachers as positive role models. The Missouri Department of Elementary and Secondary Education (DESE) coordinates the program with financial support provided by the Boeing Company and the Monsanto Fund. The Northwest Missouri Regional Teacher of the Year celebration is sponsored by Northwest Missouri State University and the Northwest Regional Professional Development Center in collaboration with the Northwest Missouri Association of School Administrators, Missouri State Teachers Association, L.J. Hart & Company, North Central Missouri College and Missouri Western State University. The Northwest Regional Professional Development Center, a fixture at Northwest since 1995, is contracted through DESE and provides professional development and direct support to 59 school districts in the 15-county northwest Missouri region.